Nokia introduces full portfolio including Nokia X, Nokia X+ and Nokia XL smartphones to bring Internet and cloud services to 'next billion'. Recently at Mobile World Congress, Nokia underscored its commitment to connecting the next billion to the Internet by releasing five new affordable handsets, including Nokia X, a family of smartphones that run Android(TM) apps, Microsoft services and signature Nokia experiences. The Nokia X, Nokia X+ and Nokia XL are priced to capture the fast-growing affordable smartphone market and provide an on-ramp to Lumia and Microsoft services like Skype, OneDrive and Outlook. 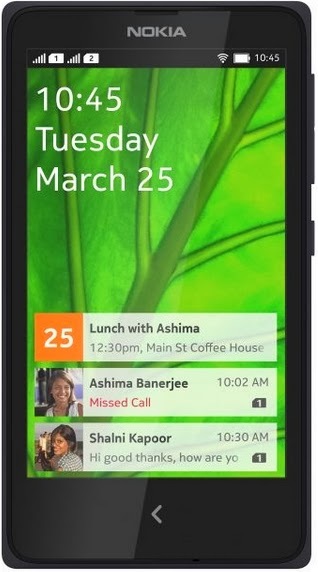 The Nokia Asha 230 is Nokia's most affordable full-touch Asha device to date, priced at EUR 45. The Nokia 220 is an Internet-ready mobile phone with social apps, priced at only EUR 29. "Nokia has connected billions of people around the world, and today we demonstrated how our portfolio is designed to connect the next billion people to great experiences." "Our deliberate approach is to offer four tiers of products including our affordable entry-level devices like the new Nokia 220; our entry-level Asha touch phones like the new Nokia Asha 230; our new Nokia X, Nokia X+ and Nokia XL smartphones primarily for growth economies; and our Lumia portfolio, which is where we introduce the greatest innovation and provide full compatibility with the Microsoft experience," he added. The Nokia X family features Nokia's renowned handset quality and design, with a fresh, tile-based user interface inspired by our Lumia family. All devices come with Fastlane, a screen which lets people switch between their favorite apps more smoothly. People can access curated, quality-tested apps from Nokia Store, more than a dozen third-party app stores and by side loading. Out of the box, they can enjoy signature Nokia experiences including free* HERE Maps, with true offline maps and integrated turn-by-turn navigation, and Nokia Mix Radio for free* music streaming and downloadable playlists. All devices are also pre-loaded with a variety of third-party apps and games. The Nokia X family is also an affordable introduction to popular Microsoft services, including free* cloud storage using OneDrive. With the purchase of any Nokia X family smartphone in select markets, people will get one month of Skype's Unlimited World Subscription for a limited time, ideal to make international calls to landlines in more than 60 countries and to mobile phones in 8 countries. 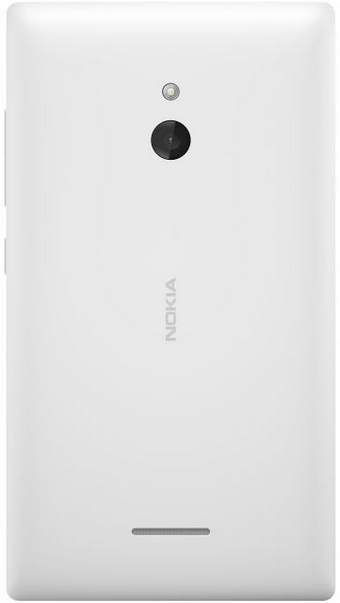 The first device, the Nokia X, comes with a 4" IPS capacitive display and 3MP camera. The Nokia X+ is optimized for multimedia enthusiasts, who can enjoy even more games, music, photos and video thanks to more memory and storage. 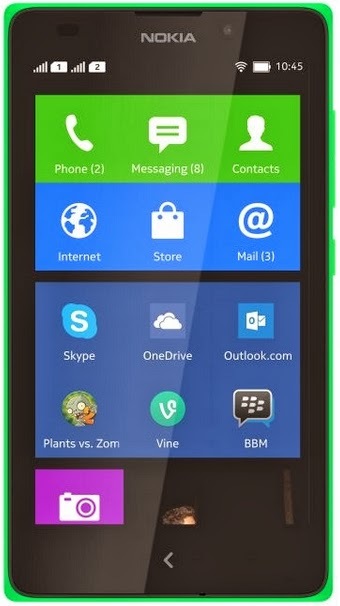 Both the Nokia X and Nokia X+ will be available in bright green, bright red, cyan, yellow, black and white**. The third family member, the Nokia XL, boasts a 5" display with 2MP front-facing camera - ideal for Skype video calls - and a 5MP rear-facing, auto-focus camera with flash. 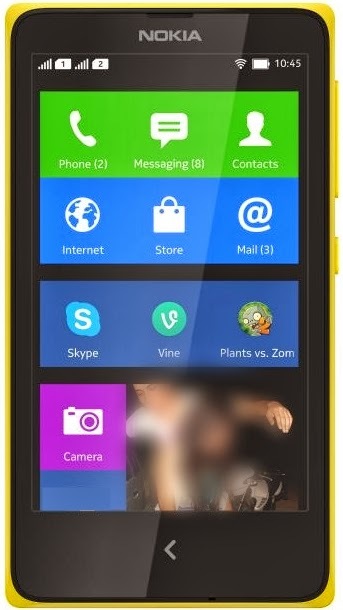 The Nokia XL will be available in bright green, orange, cyan, yellow, black and white. The entire Nokia X family is powered by the Qualcomm® Snapdragon(TM) dual core processor and supports Dual SIM, letting people switch SIM cards to get better tariffs. * Data charges may apply. ** Colour availability for all devices mentioned will vary by market. *** All prices are suggested retail before local taxes and subsidies. Actual in-market prices may vary.